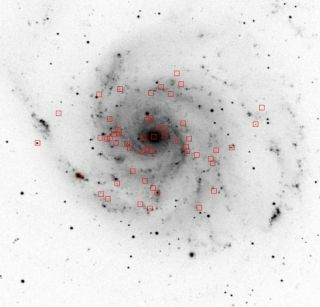 In this negative image of the Pinwheel Galaxy (M101), red squares mark the positions of "super-soft" X-ray sources. The Pinwheel should contain hundreds of accreting white dwarfs on which nuclear fusion is occurring, which should produce prodigious X-rays. Yet we only detect a few dozen super-soft X-ray sources. This means that we must devise new methods to search for the elusive progenitors of Type Ia supernovas. Why certain stars explode in supernovas is a mystery toscientists, and a new study finds the situation is even murkier than thoughtbecause some of the light from these stars may be blocked. To understand more about these cosmic explosions,astronomers are hunting for ticking time bombs ? stars that are on the tracktoward becoming supernovas. Yet the missing light could make the search evenharder. Supernovas mark the death of a star, when it stops shininglight created through nuclear fusion and instead collapses into an extremelydense black hole. A subset of supernovas called TypeIa supernovas are the gold standard in astronomy.They are thought to erupt when a dense, dim star called a white dwarf hits acertain upper limit in mass and explodes. But astronomers are still confused byjust what cases white dwarfs to hitthat mass limit and explode. "The question of what causes aType Ia supernova is one of the great unsolved mysteries in astronomy,"said researcher Rosanne Di Stefano of the Harvard-Smithsonian Center forAstrophysics. One scenario envisions a white dwarfgradually siphoning off mass from another white dwarf companion until it bulgesover the limit. Another idea is that two white dwarfs merge to become onebehemoth that topples the limit and explodes. To get to the bottom of the mystery,scientists have been searching for white dwarfs in the stage before they getmassive enough to explode. In particular, astronomers hunt for so-called"super-soft" X-rays, which are thought to be created when gas fromone star hits another star's surface and undergoes nuclear fusion. This should happen in either thesiphoning or merging scenarioDi Stefano said, though the amount of lightand particular signatures could tell scientists more about which occurs moreoften. Yet for some reason, scientists haveonly been able to find a handful of these X-ray sources, where they expected tofind hundreds. In a new paper, Di Stefano proposesthat some process is blocking this light from reaching our telescopes on Earth.Perhaps some other material surrounding the white dwarf absorbs the X-raysafter they are emitted so we can't see them. Or maybe white dwarfs emit most oftheir light at wavelengths other than X-rays. If this is true, "we must devisenew methods to search for the elusive progenitors of Type Ia supernovae," DiStefano said. Di Stefano's paper will be publishedin an upcoming issue of the Astrophysical Journal.